About Deborah M. Message Deborah M.
Deborah was amazing. 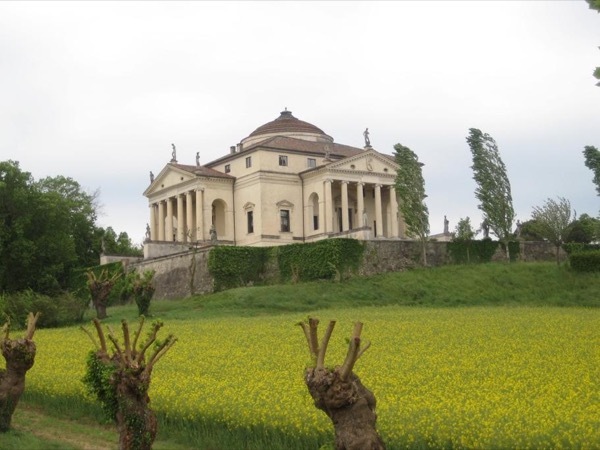 She was incredibly knowledgeable of Vicenza and the architecture of Palladio. As there were just two of us on a private tour, we had the opportunity to ask questions and direct the tour to our interests. During booking, Deborah responded to our inquiry quickly and was flexible with scheduling. She met us at our hotel and spent over two hours sharing her knowledge. I would recommend Deborah to friends and family and intend to contact her again when I return to the area. TOUR GUIDE RESPONSE: Dear Sandra, thanks for these beautiful words. You and your sister are two special persons, and I loved your questions because you gave me the opportunity to "leave the usual track" of tour and do something different. Really hope to meet you again. Deborah was a very knowledgeable and wonderful guide. She gave a very comprehensive tour of Padua's city center, scrovegni chapel and st anthony basilica. We also stopped by a local famous cafe for delicious coffee! TOUR GUIDE RESPONSE: Thank you, Izabela, for your review. It was my great pleasure to meet you and your parents. So happy you enjoy the tour and the coffee! Hope to meet you again. This was an excellent morning in Treviso with Deborah and Treviso is an easy and short short trip out of Venice on the train. TOUR GUIDE RESPONSE: Dear Carol, thank you for the review. I also think that Treviso is a charming city and I am happy to have spent the morning with you. I really hope to meet you again. A wonderful, knowledgeable, most personable guide with ability to customize and improvise for Verona, Vincenzo, Venice, et al. One of the best of our many travel guides. TOUR GUIDE RESPONSE: Dear Jane and Fred, you are a wonderful couple, we had immediately a special feeling, and as you said when you left me, we are now friends. TOUR GUIDE RESPONSE: One of my best clients, ever. We loved our tour with Deborah! she is very engaging and shares an excellent perspective and history of the places you see. She took us to interesting and unique locations. The boat was a fantastic way to see parts of Venice. Murano and Burano were great. We especially enjoyed the personalized tour of the glass blowing factory! Burano is beautiful. 3 couples just spent 3 glorious days touring Verona, Vincenza and Padua with Deborah. She has a wealth of knowledge of the area's history that she brings to life in a friendly, upbeat manner and was able to tailor the days to meet our group's needs and personal interests. All arrangements were seamlessly coordinated, including transfers before and after the tour days (right down to having our driver, Laura, take us to the supermarket on the way to the villa). Highest praises for Deborah. She's awesome! TOUR GUIDE RESPONSE: 3 wonderful couples, happy, interested, enthusiastic, friendly...If guides could have the possibility to write a review to their clients...well...5 stars would not be enough for you. I really hope to have the chance to meet you all again one day. This 3 hour tour took us to some interesting places but was unfortunately shorter than we expected. The day was hot but I do not think what was planned could have taken longer. However Deborah communicated well and was able to answer all the questions we asked clearly and precisely. TOUR GUIDE RESPONSE: I am sorry that I was unable to extend your tour later than scheduled that day - as I explained at the time, I unfortunately already had another tour booked by the time you requested this. In order to enhance your experience, I offered my car and drove you to Villas instead of using the taxi as planned - this allowed us to get to more beautiful places in your limited time. I really hope we will have other possibilities to spend time together. Deborah arrived on time and was extremely knowledgeable and communicated very well. she also took notice of any specific needs or queries we had. Deborah was fantastic organised water taxi pick up from hotel to train station for our Treviso tour. A great town to visit and she showed us a wonderful time. Highly recommend anyone interested in taking this tour to do it. There are not enough words to say how AMAZING Deborah was during our experience from the time our tour was booked, to her confirmation, corresponding and verify every detail prior to our tour! From the moment we met Deborah near our Airbnb with her enthusiasm & smile, she immediately put us at ease, we knew for the next 4 hours we were in good hands on our adventure throughout Venice! She was passionate about Venice, and her knowledge of Venetian history was extensive BEST TOUR EVER WITH DEBORAH! TOUR GUIDE RESPONSE: Dear Cheryl, I can just say thank you. Thanks for your warm words. It was a great honor to be your guide in this first experience in Venice and I really hope to meet you again. Wish you all the best. Really enjoyed Deborah's tour of Venice. She was very friendly, organized and knowledgeable. TOUR GUIDE RESPONSE: Thank you, Trini. It was a great pleasure, I spent a wonderful morning with you all. Deborah is an amazing very friendly guide! Worked in all my special requests and was fun to be with. I hope we meet again next time I'm in the area! Deborah was a wonderful guide and very accommodating. We've been to Venice twice already, but this third trip was the best visit yet because of her carefully planned itinerary for our family. I readily recommend her to anyone that is touring the Venice area. TOUR GUIDE RESPONSE: Thank you, Brett, I am more than happy to know that you appreciated my work. I also want to thank you because although you have been already to Venice, you are still an enthusiastic visitor ready to discover new things. I hope to have the pleasure to meet you and your nice family again. Deborah was amazing. Warm, friendly, great sense of humor, and above all incredibly knowledgeable about Venice and the churches and the art in them. And to top it all off she introduced us to an aperol spritz—-wonderful icing on the cake. WOW!! TOUR GUIDE RESPONSE: Great time together, Dave, very nice people, a wonderful morning. Thank you for the opportunity you gave me to meet you all. Our Venice by Night Tour with Deborah was within the first few hours of arriving in the city and she was amazing! Even though it was a rainy evening it didn't matter because Deborah was organized and prepared. Her knowledge and love of Venice came across throughout the entire tour. The boat ride through the canals as the lights were coming on gave us a memory we will never forget. Deborah was the perfect person to introduce us to this spectacular city. TOUR GUIDE RESPONSE: And you, Philomena, and Steve were the perfect persons for this tour. Since the beginning you were opened to anything and enthusiastic although the weather wad not good and the alarm for the coming tide was playing. I will never forget your kindness and enthusiasm. Very good guide very interesting tour , a great way to see a new historical town. TOUR GUIDE RESPONSE: I am happy you enjoyed my tour. Thanks! You brought me a beautiful morning of sun after many days of rain! Deborah was a marvelous guide with a lot of local historical and art knowlodge of Padova. TOUR GUIDE RESPONSE: Thanks Leslie, so happy you enjoyed the tour. Hope to meet you again. TOUR GUIDE RESPONSE: Thanks Donald for your review, hope to meet you and your wife again. Deborah was Awesome, she led the tour well. We were able to ask her a miriad of questions and had them all answered while still staying on track. She showed us the "Venitian" side of Venice. Was able to see things we would have never found without her. TOUR GUIDE RESPONSE: Thanks for your feedback. It was a great pleasure to end this working year with you. As I always say, the success of a tour is possible when we want to discover, learn and enjoy. It was a very pleasant day. Thank you! Deborah was AWESOME! We were able to get off-the-beaten path and see places that are most often over-looked by the tourists. Deborah is extremely knowledgable about the history of Venice and is truly passionate about this beautiful city! You will not be disappointed and will walk away with a new friend in Venice!!!! TOUR GUIDE RESPONSE: Thank you Robert, hope to meet you again. TOUR GUIDE RESPONSE: Thank you Bart and Mary. I really enjoy my work when I have the pleasure to spend time with experts and passionate travellers. Debora did an excellent tour covering the highlights of Verona. She was extremely friendly and caring of if my wife and my interests. Although it has been many months since our tour with Deborah, we still remember if vividly! She was loaded with information, patient with the delivery and answered all of our questions!! The City is awesome and she did a great job pointing out many interesting sites and telling us of its amazing history. We especially enjoyed her sweet nature and getting to know of her life in Verona. Your visit to Verona would be greatly enhanced by a tour with Deborah! TOUR GUIDE RESPONSE: Dear Cathie, I also remember the nice afternoon we spent together. I am glad you enjoyed the city and my tour and hope to meet you again. We so enjoyed our tour of Vincenza architecture with Deborah on Oct 4, 2017. She is extremely knowledgeable and able to present the diverse styles of Vincenza architecture in context that was easy to understand. She also graciously answered our many questions and it was obvious to us that she loves the topic of Italy's architecture and continues to be an eager learner about the topic. We would highly recommend this tour, with Deborah, to all travelers. TOUR GUIDE RESPONSE: It was my great pleasure, hope to meet you again. Deborah helped me to plan a great day for my extended family. TOUR GUIDE RESPONSE: Dear Margery, I am so happy to know that you had a great time with your family. It was my great pleasure to help you. I know how you feel, distance is never good, I also have part of my family in the States and we do not meet often. Take care and hope to help you again. My family and I were extremely happy that we chose Deborah to be our tour guide in Verona. She is both knowledgeable and engaging. Thanks to Deborah we learned so much, saw so much, and had a wonderful, fun, and productive day with her in Verona. We got the most out of our visit to Verona thanks to Deborah. I highly recommend her. TOUR GUIDE RESPONSE: It was a great and funny morning. Nice feeling since the beginning. Thank you all and I hope to meet you again. Deborah was a very good guide. She was kind, funny, and very knowledgeable about Padua. We spent all day with Deborah, visiting Treviso and Padua. It was a very nice day. Deborah was very knowledgeable about both cities and we enjoyed her company. We loved Treviso. Deborah was awesome… She met us on the train into Venice at the Padua station (where we were staying in the city center). We had a great tour by boat, lunch at Danieli Terrace, followed by a vaporetto ride back to the train station She was very knowledgeable, friendly and enthusiastic about the Veneto region and Palladio!! TOUR GUIDE RESPONSE: Thanks Tom for your feedback. It was a great time for me too. Hope to see you again! Deborah was the perfect guide for me and my 22 year old granddaughter. She was so lovely, so knowledgeable, and so interesting. She tailored our tour to our interests and answered all our questions, including about life in Venice. I will not hesitate to recommend her to friends and family traveling to Venice. TOUR GUIDE RESPONSE: Thank you Diane, it was a wonderful day and you and your granddaughter are very special persons. Hope to meet you again! Great tour. Deborah was most informative and very pleasant. Would certainly go on a tour with her again. Please see our great review from June 13 .... Deborah was FANTASTIC .... don't miss booking her. Deborah was a terrific guide in Verona and Venice. She was extremely knowledgeable and most importantly she was genuine and patient, and very kind. She had hidden gems to see. When we come back to Venice which we absolutely will do there is no question that we would rehire Deborah to be our guide as to the time with her was totally enjoyable. TOUR GUIDE RESPONSE: Thank you for the feedback. I also had a great time, and fun,with you all. A pleasure to meet you again. Our tour around Verona with Deborah was fantastic!! She has an amazing knowledge of all things italian, particularly history and art. We were fascinated from tour start to finish and she is full of fun facts and stories, showing and explaining parts of Venice that standard tours would not include. Thoroughly recommend Deborah to anyone visiting Venice. TOUR GUIDE RESPONSE: GRAZIE A VOI! Wonderful time together....too short! I hope to meet you again. CIAO! TOUR GUIDE RESPONSE: Thank you! It was a wonderful day! Hope to meet you soon. We could not have wished for a better tour guide than Deborah. Having been born in Venice, she knew the history first-hand, and knew the city like the back of her hand. We made our way off of the main tourist paths and into the heart of Venice. Highly recommend Deborah. 5 stars out of 5. TOUR GUIDE RESPONSE: Hi Karen and Paul, we spent a nice time together and I was honored to be your guide in your first visit. Hope to meet you again. TOUR GUIDE RESPONSE: Thanks! My pleasure. Deborah was the perfect guide for a very personalized walk through the many hidden and surprising sites, historical landmarks and simply beautiful reminders of what has kept pulling us back into the heart of Venice. She is a classically trained, pragmatically oriented specialist in this niche area of up-close-and-personal travel and introduced us to breathtaking locales and hard-to-find treasures that we had only read about. We felt her love for this city and were able to reach out and touch its beauty. TOUR GUIDE RESPONSE: Dear Ben and Kathy, as I Always say, the success of a tour is a combination of soul and passion. It has been a soul harmony between you and me since the beginning. You are a wonderful couple, open-minded and still capable to enjoy and be surprised. It was a pleasure and an Honor to spend these days with you. Deborah gave us the perfect re-introduction to a Venice that we had only breezed by in earlier years, taking us to special sites, historical landmarks and beautiful vistas from the perspective of a nighttime cruise through the canals of this gem of the Italian Renaissance. Her familiarity with Venice as a native and her university education equipped her with the technical skills to open up Venice at night and make it more meaningful to us. Her love of this city and its rich heritage was deep and sincere. TOUR GUIDE RESPONSE: Thanks again ! Deborah was an amazing guide. She had in-depth knowledge and was very engaging. She kept it interesting and upbeat. Highly recommend! Enjoyed Deborah's company, her interesting stories about the sights we visited, her suggestions for authentic, rustic and local food. Would seek her out again for future visits in this area. TOUR GUIDE RESPONSE: Dear Regina, I really spent wonderful time with you. Hope to meet you again!! Deborah is a great guide, she brought us to an area away from the usual tour spots. She shared a lot of history and anecdotes about the places/people, thus making it interesting for us. toured Vicenza same day day and Padua. Worth the effort. TOUR GUIDE RESPONSE: Hi thanks fpr your reference. I hope to meet your very nice family again. Padua is a wonderful town - worth the 1 hour train ride from Venice. Deborah was knowledgeable, easy to deal with and flexible. Highly recommend. TOUR GUIDE RESPONSE: Thanks! wonderful family, I still remember our nice day in Padua. We liked Deborah's enthusiasm and passion for the sites she took us to. Her knowledge and obvious pride for Verona gave us an insight to the history and culture. Deborah was considerate and very easy to talk with. We hope to return to Verona and be guided by Deborah. We had a terrific tour experience with Deborah! She was sensitive to our interests, extremely informed and engaging. We not only saw many things we would have otherwise missed, but understood so much more from the historical and social context Deborah provided. Her recommendations on restaurants, additional sites, touring strategies to maximize our time during the rest of our visit, etc. were invaluable. My wife and I can confidently recommend Deborah highly. TOUR GUIDE RESPONSE: Dear Arthur, it was a great pleasure to spend a little time with you. You are a wonderful couple. I hope to meet you again. Deborah was awesome. She gave us a great overview of Venice with.a true local perspective. We would highly recommend her for a tour of this beautiful city. TOUR GUIDE RESPONSE: My pleasure to guide you all your first time in Venice. I hope there will be a second one....thanks! Wonderful time for the entire family ages 14 - 49). I would highly recommend Deborah!! TOUR GUIDE RESPONSE: It was a special day for me too. Nice family, friendly, enthusiastic... as we have met before. Hope to meet you again. Bright, happy, thoroughly informed, flexible, prompt, and a lovely person. TOUR GUIDE RESPONSE: Like you and Rikki. Never forget! Loved it. The tour was a great way to maximize our time in Verona. We saw much more than we would have on our own. Deborah did an amazing job showing us Venice. From the minute she greeted us at our hotel, everything was wonderful. She was so knowledgeable and she told us so many stories. It was a great day!!!! I would totally book another tour with Deborah the next time my family and I are in Venice. TOUR GUIDE RESPONSE: Lori, it was a great pleasure, I really spent a wonderful day with you and your husband. Hope to meet you again! thank you! There were five females ranging from 17-73 and we requested a customized tour which was splendid! She was a fount of information and her English was excellent. She was available prior to our arrival in Vicenza to advise on what I could and could not fit into our schedule while in the region. The girls thought she was knowledgeable and cool. She gave us many tips about travel, grocery shopping, restaurants, etc. We will recommend her to friends. TOUR GUIDE RESPONSE: Thank you! I had a great time with you too. You are that kind of clients with whom it is so easy to make the tour enjoyble for everyone. Hope to meet you again. Deborah is a very knowledgable, enthusiastic guide with a delightful, engaging personality. She brought the history, arts, and culture of Vicenza alive over the centuries. TOUR GUIDE RESPONSE: I really enjoyed the morning with you, thanks, it was a pleasure to meet you. We had an unusual request to guide our wedding party thru the old part of Treviso Dispersing info and showing us the most scenic areas for photos. She was very flexible, patient and informative. TOUR GUIDE RESPONSE: Thank you, I really enjoyed this tour! Good luck! TOUR GUIDE RESPONSE: Thanks hope to meet you again. What an awesome way to end our visit to Venice. Actually I wished we would have used Deborah at the start of out visit. The tour of the hidden treasures of Venice was perfect. We got a great feel for the real Venice and all of the local neighborhoods. We saw sites I know we would have never discovered on our own or with a large tour group. Her local knowledge is incredible. Her art and history expertise is astounding. Every question we asked she answered. She sets a great pace that is easy to follow. TOUR GUIDE RESPONSE: Please Ralph, remember we just visited one district....you still have other five...next time you come.... thanks. Deborah's local knowledge was of invaluable help on this tour. In my experience something always goes wrong on these tours. If the guide is really great they know how to make things happen without missing a beat. That happened on this tour and she pulled it off. Thanks Deborah. TOUR GUIDE RESPONSE: Thank you! I also had a nice time with you all, I felt like in a family tour. Great tour of the city. Deborah took us to all the must see attractions of Padua for the time we had. Her knowledge of art and history is impressive. Set an easy, steady pace. We didn't feel hurried. TOUR GUIDE RESPONSE: Thank you, Ralph. We spent a week in venice and had the pleasure of Deborah as our guide for our tour of Verona. I have travelled extensively and taken many guided tours and she is simply the best I have experienced. She is extremely knowledgable about the art in the two cities and a joy to spend the day with. She organized both tours and made all the arrangements ahead of time. It couldn't have been easier. She is a true professional. The highlight of our tour was San Zeno in Verona. I would highly recommend Deborah. Deborah was outstanding and I will recommend her to friends always! I will tour with Deborah again! TOUR GUIDE RESPONSE: Thank you Robert, it was my pleasure to meet you and your nice family and the cute CJ. Keep in touch!